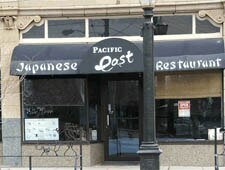 Pacific East offers traditional sushi and gracious service in Coventry. : With an interior painted a cool blue and accented by red wood tables and chairs, Pacific East serves some of the best sushi and sashimi in the city. A small sushi bar in one corner provides sparse, but ample, space for chefs to create attractive dishes with machine-like precision. None of the sushi is pre-made, so when they are busy, there can be a bit of a wait. What’s more, they use only super premium short grain rice and super fresh fish. In addition to the dozens of sushi options, many vegetarian, tempura, yakitori, udon, donburi and teriyaki dishes are available. Deciding what to order can be difficult, but we recommend the lobster tempura roll, the volcano roll, and the eel and mushroom roll. Drinks and desserts are limited, so perhaps order an extra roll or two instead.